It's the last day of school for my kids today. Sometimes I think it seems cruel that they make them go so late, but as a Mom, I'm glad because the summer can be crazy busy in it's own way. I wanted to make a quick gift for my youngest's teacher. Quick is of the essence these days with all that we have going on at the end of the school year. I am sure her teacher is looking forward to a summer of relaxing without 20 eight year olds to deal with every day, and I think that the Beach Bum stamp set is a set that says summer fun all over! 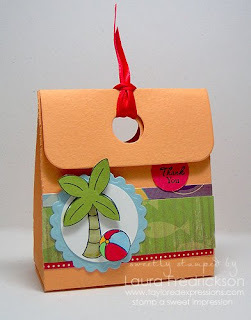 I started with one of the Party Favour boxes from Taylored Expressions. These little boxes make a simple gift just that much more fun! They come cut and scored, and a strip of high tack adhesive is all that's needed to put it together. I took a strip of designer paper from the Beach Bum Key Ingredients kit and two of the border stickers from the sticker sheet from the kit to adorn the front of the box. I stamped the tree and punched the image out with a 1 1/2" circle punch and framed it with a scalloped circle cut with a Nestability. 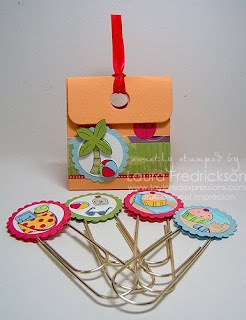 I stamped the tree top on the green cardstock from the kit and popped it up, and added the beach ball on pop dots too. I had originally stamped the sentiment "Thank You" from the Beary Special Accessories set directly on the box, but wouldn't you know, I got it crooked. So I stamped it again and punched it out in a circle and adhered it over my first attempt. I picked up the clips some time ago at the dollar store, but they also sell them at Staples. I stamped and coloured four different images (twice each) and layered them on scalloped circles cut from the cardstock included in the Beach Bum Key Ingredients kit. I positioned them back to back over the clip adhering them with a pop up glue dot, sealing them with dry adhesive. These little clips make great bookmarks, but for a teacher these just might be the most fun a paper clip can be! I have yet to see a teacher's desk that didn't have 4 or 5 stacks of paper on their desk waiting for distribution to the class. I hope these will help keep her organized and smiling! Quick, cute and functional...everything you wanted a stamping project to be! Have a wonderful day and keep smiling! This is so adorable Laura! Love all the bright colours and it's such a perfect teacher gift! How very cute, Laura. What a super fun gift for that teacher to get. I received my first order from Taylored Expressions last week and I'm loving the paper kit. I was very impressed with all of it, so I'm sure I will become a regular customer. 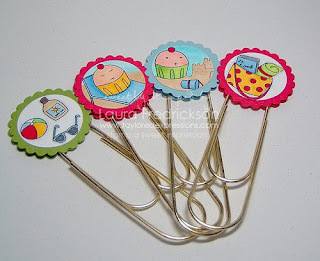 I just love these little clips - so, so cute! Adorable little gift, Laura! Wow your kids did go late eh? Chloe was out on Friday. What a darling and perfect teacher's gift. Love these! What a super cute teacher gift Laura!! Love it!! GREAT teacher gift, beautifully done! ...and you know, I've always wanted to make these altered paper clips but NEVER have. I need to! These are ADORABLE Laura! What an awesome idea! I totally need to make myself some of those clips!!! So cool! I chose your brilliant idea for my "10 BEST Paper clip bookmark ideas": http://hafsacreates.com/2012/12/20/10-paper-clip-bookmarks-ideas/ - Thanks for sharing!